Stepping out of the train station, sweaty and sluggish, we were glad that our hostel was just a short walk away. As we dragged ourselves through the mediocre town square, not bothering to take any notice of the surroundings, we were both thinking the same thing, 'Annecy looks nothing like we imagined.' Feeling a little disinterested and totally oblivious, we carried on walking. As we turned the corner and onto the street where our hostel lived, we were suddenly faced with the exact thing, which we had both been seeking... The Alps. As we gratefully admired the misty mountains and their distant magic, we both knew that was no need for negotiation and discussions, obviously we we're staying for another night. 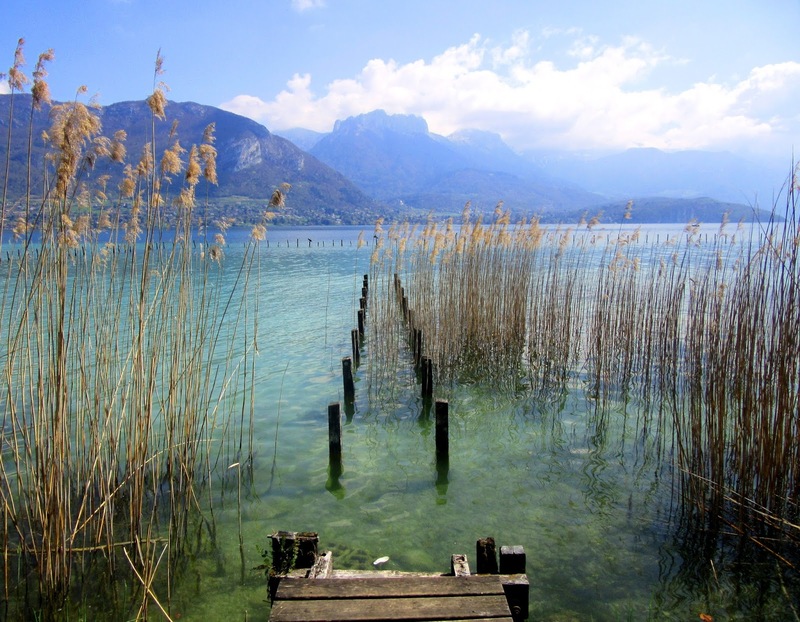 We stayed at Annecy Hostel for two nights, and it was pretty cool. It was the first hostel where stayed that we made backpacker buddies, but there wasn't much chance for chit-chat and story swaps because as soon as Jack and I arrived, we wanted to abandon our backpacks, postpone the shower and explore. We wandered around Annecy with no idea where we were going, our only guide was the misty rock formations and the blur of green in the distance. After a short walk, we were in the Old Town. It was a charming, little place, complemented by a warming atmosphere, cobbled streets, and pastel-coloured houses. I was so excited to explore and capture every single detail of this traditional town, but as the sun was beginning to set and we were hungry, we decided that our need for mountains and nature would have to wait until tomorrow. Suncream? Check. Picnic? Check. A plan for the day ahead? Nope. We were so excited to leave the hostel and spend as much time outdoors that the only plan we had in mind was to just to 'go with it'. The sun was shining, the air was pleasant, and the day ahead was perfect already. I slowly took my time along the canal, appreciating every small detail of this historical, French town, and as the sunlight awakened the colourful surroundings, the town looked even more majestic than yesterday. As we came to the end of the town, an incredible lake, which stretched out for miles was at our feet and as we walked along the clear, blue and green water, I felt hypnotised. The day couldn't look and feel more perfect, I felt the most invigorating sense of calmness. I can't remember if Jack and I actually had a conversation about where we were going, I think we already knew the journey somehow, as if our bodies had already made the decision, coexisting with the wind simultaneously, as we wandered aimlessly with only our subconscious as a guide. We stopped every now and again to share the experience but no words were needed today, the peace and quiet was euphoric. The nature, complemented with the lives of the locals lit up our path, there was so much to see and admire, as we passed by the contrasting but elegant sights on either side of us. I have no idea how long it had been since we left the hostel this morning or even what time it was when we decided that we were hungry and in need of a rest, I felt as if I had been floating alongside the lake all day, as if the water and the wind were delicately carrying me on my journey. Time did not exist today, we were in no rush to get anywhere and we had no destination in mind. We sat down and had a picnic. It was so relaxing and peaceful where we were that I took a nap without even realising, until I woke up forgetting where I was for a split second. As I sat up, I couldn't believe how lucky I was to be sat here in this moment, accompanied by the azure sky and the earth below, of which I was apart of. The walk back was just as pleasant, it was late afternoon and the sun felt even hotter than it did this morning. Every now and again we would stop to acknowledge the sound of the waves and the many, many colours reflecting nature's personality. It was my favourite day so far, and it was only the seventh day of our trip. We spent the evening at the hostel with our new backpacker buddies; cooking pasta, drinking wine, 'learning' French and talking about the latest series of Game of Thrones. It was really good fun but a bottle of wine later, it was time to say goodnight to Annecy and goodbye to our new friends, because the next day we were going to Austria, and I couldn't wait. From one side of the Alps to another... Here we come.